Posted July 27, 2018 by Norburn Lighting and Bath Centre & filed under Tips and Advice . When switching over from an incandescent bulb to an LED, it is important to remember that they are measured differently. Incandescent bulbs are measured in watts, while LEDs are measured in lumens. Watts measure the amount of energy needed to produce an output of light. A higher wattage indicates a brighter bulb, and thus requires more energy to produce the intensity. Lumens measure the amount of light output rather than measuring the amount of energy. Determine the wattage of your current incandescent bulb and reference the chart below by ENERGY STAR®. The chart shows the amount of lumens needed to produce the same output of light as an incandescent bulb. Colour is another important aspect of LED bulbs that can really affect the overall feel and look of a space. The colour output of an LED is measured in Kelvin temperature (K). Kelvin temperature ranges from warm (2700K) to cool (5000K). The higher the Kelvin temperature the more blue/white the colour output will be, and the more it will resemble daylight. The lower the Kelvin temperature, the colour output will appear more yellow, and the more it will resemble the look of candle lighting. Colour temperature is something personal, which means what might be appropriate for one person might not be for another person. However, to narrow down your choices, consider the mood, functionality, and decor of the room when deciding on colour temperature. For instance, a 2700K (warm white) LED might be used for a bedroom or dining room because it has a warmer output of light that gives off an intimate and comforting ambience. Whereas, a 3000K (soft white) LED might be used in a bathroom or kitchen, since it gives off a bluish tone that will make a space appear brighter or clean which is important for task oriented spaces. Decor can also influence what you decide to use in a space. You might have certain furniture, wallpaper, or flooring that look better under certain colour temperatures instead of what is typically used. For instance, a 2700K (warm white) LED might be an ideal choice for a living room to give off a comforting ambience but if your furniture is white, it might not look as crisp and white. Some homeowners already have dimmers for their incandescent bulbs, and often think it will work similarly with a new LED. When the dimmer is not compatible with the LED, you will often notice “flickering,” and the lifespan of the LED will significantly decline. LED packaging will often indicate if it is dimmable, but never hesitate to ask a Lighting Specialist if the LED will work with your existing dimmer, or if you will require a new dimmer that is compatible with LED. LEDs will have a similar base as it’s incandescent counterpart, but the design of an LED might be slightly larger. When making the switch, bring your existing bulb to see whether there is a significant size difference that will affect how it looks on your portable lighting or fixture. Everyone wants to know the real value of LEDs. On ENERGY STAR® Certified bulbs, the estimated energy saving will often be indicated on the packaging. ENERGY RATE – Identify Energy Rate for your area, which can be found on your monthly bill (kWh). For more information on LEDs, contact or visit our showroom. Our Specialist are always happy to help and guarantee quality products at the right price! Posted May 18, 2018 by Norburn Lighting and Bath Centre & filed under Sales and Promotions . Don’t forget our Fan Blowout Sale runs from May 1 to May 31, 2018. All regular priced ceiling fans are 20% off during this month only. (20% off applies to regular priced ceiling fans only, and excludes ceiling fans that are tagged “special price” or have already been marked down). For more information, visit or contact your local showroom. Our Specialist are always happy to help! Posted February 16, 2018 by Norburn Lighting and Bath Centre & filed under New Products . Technology is rapidly changing, and with the growing popularity of Siri, Alexa, and Cortana comes highly innovative products that reshape how we live our day to day life. During Market, Modern Forms unveiled their new line of Smart Fans, equipped with their signature aesthetically evoking designs, and superior quality. What Makes a fan SMART? The fans designed by Modern Forms are made to correspond with existing smart home devices such as Google Assistant, Amazon Echo, and Nest & Ecobee. You are able to schedule usage, and control the speed and illumination of the fans from your smartphone device, or by voice command. In addition, Modern Forms has developed an app that makes controlling your smart fan so much easier. With the Modern Forms app, you can control your smart fan features whether you are in the room, or miles away. The Fans are made with durable Aluminum hardware, ABS blades, and integrated LED luminaires, assuring the longevity of the product. The fans also have a lumen output range from 1110lm to 2041lm depending on the chosen fan style. In addition, the fans are made with a DC motor, known to have minimal sound with high energy savings. The smart fans are also wet-rated, allowing them to be installed in both indoor and outdoor settings, such as patios, or gazebos for a cohesive look throughout the home. For larger spaces that require multiple fans, the smart fans by Modern Forms can work in a singular circuit without losing synchronization. Benefits of a Smart fan? One of the major benefits of using a fan is the potential savings it can provide a household. Though the amount of savings also depends on other factors such as the adjustment of the thermostat and usage, you can still potentially save 30-40% using a fan year-round as they help recirculate warm and cool air within a space. With Smart Fans, they not only provide convenience, but can also contribute to the potential savings by being able to control when the fan is turned on and off through a smartphone device, reducing unnecessary usage. In addition, the smart fans are also designed with DC Motors. DC motors are described as being more energy efficient, as they use less power to move air around the room. Aside from the potential savings a smart fan also give you a sense of full control over your lighting. Regardless of whether you are at home, at work, or on vacation, being able to control your lighting system through the convenience of your smartphone device can become advantageous when you have forgotten to turn off the fan before heading out the door, or when you want to ensure your home does not look vacant, deterring intruders from breaking in. Each year more and more innovative designs are being introduced that incorporate modern technology. It comes to no surprise that the whole home automation will soon become the norm. How do you feel about technology enriched homes or the new Modern Forms Smart Fans? We would love to know! For more information on the Modern Forms Smart Fans, contact or visit our showroom, our Specialist are always happy to help. Posted November 3, 2017 by Norburn Lighting and Bath Centre & filed under Sales and Promotions . This Saturday, November 4, 2017 we are hosting another Spin to Win event. 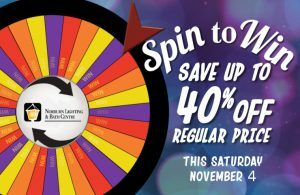 Spin the wheel and save up to 40% on regular priced items. (this excludes items that are on an every-day-low, or are already discounted). This is a one day event so don’t miss out, stop by and test your luck!